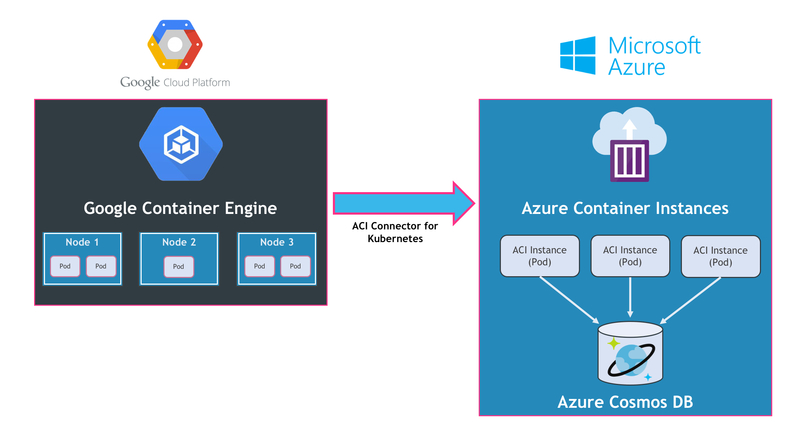 In the final part of our look into Azure Container Instances (ACI), we will deploy a microservices application that spans Google Cloud Platform (GCP) and Microsoft Azure. 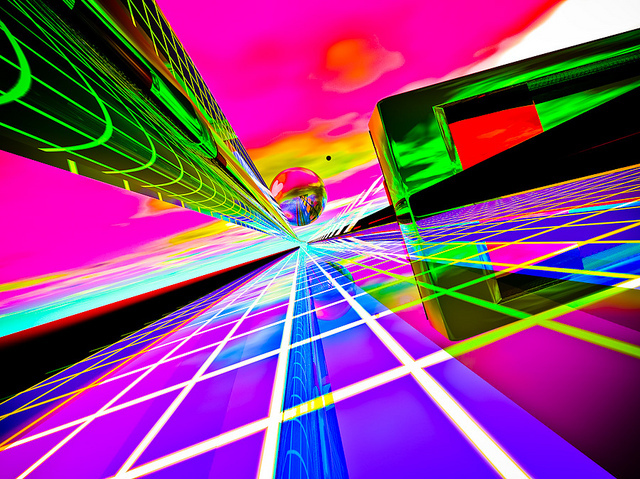 This multicloud architecture is based on the ACI Connector for Kubernetes, which bridges the gap between a full-blown orchestration engine (Kubernetes) and serverless containers (ACI). Azure Container Instances is designed to be a lightweight serverless environment meant to run single-container workloads. The job of managing a microservices application composed of multiple containers is better handled by an orchestration engine like Kubernetes, Mesosphere DC/OS, or Docker in Swarm mode. A full-fledged container orchestrator handles tasks including scheduling, service discovery, scaling, health monitoring, logging, and much more. It provides end-to-end lifecycle management of microservices. ACI handles the lifecycle of one instance at a time. It does not have advanced scheduling capabilities and other functions needed to tackle microservices. By bridging the gap between a container orchestrator and ACI, customers can get best of both worlds. 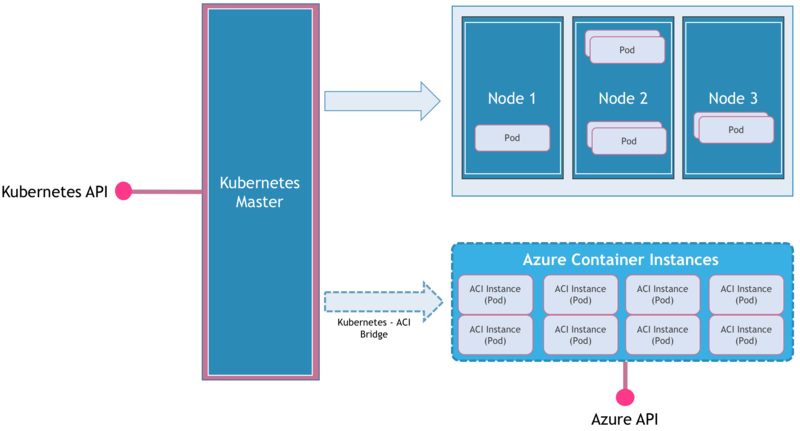 To demonstrate this, Microsoft has built ACI Connector for Kubernetes as a reference implementation. It is possible to build similar connectors for other container management platforms. When I encountered this project, the first thing that hit me was the integration of a Kubernetes cluster running in Google Cloud with Azure Container Instances. This tutorial gives you a glimpse of what is possible with ACI Connector for Kubernetes. Please note that this project is experimental that is not suitable for production environments. We will setup a testbed in US West region spanning both Google Cloud Platform and Microsoft Azure. On the GCP side, we will have a three-node Kubernetes cluster. A Resource Group to hold the ACI instances will be created in Azure. The microservices application that we deploy was covered in detail in a previous article. It’s a Node.js-based web application that talks to Azure Cosmos DB. Before proceeding with the next steps, ensure that you have an active account with GCP and Microsoft Azure. You will need to download and configure the latest version of kubectl, gcloud and az command line tools on your machine. I have made the entire script available as a GitHub Gist. In Azure, we will create a Resource Group that holds all the resources that we provision for this project. This Resource Group will hold Container Instances and Cosmos DB. We also need to create an Active Directory Service Principal to enable authentication of ACI from Kubernetes. Finally, let’s create a Service Principal to enable GKE to create Container Instances in Azure. Grab the appID, password, and tenant from the output of this command. We need it to populate the ACI Connector. Finally, ensure that the Container Instances resource is registered for ARM. With both the cloud platforms configured, it’s time for us to connect them. We will do that by deploying a special pod in GKE that becomes a virtual node pointing to ACI. After a minute or so, check the availability of ACI virtual node with kubectl get nodes command. The final step is to create a pod that gets deployed to ACI. We will do this by creating the following file saved as web.yaml. Update the connection string environment variable with the Cosmos DB connection string. The YAML file is available as a Gist on GitHub. spec: containers: - image: janakiramm/todo imagePullPolicy: Always name: web env: - name: "DB" value: "COSMOS_DB_CONN_STR" - name: "PORT" value: "80"
The Docker image, janakiramm/todo contains the simple Node.js Todo web application. Notice the additional parameter nodeName in the pod definition which forces Kubernetes scheduler to schedule it in the node called aci-connector. Due to this parameter, Kubernetes will delegate the scheduling process to ACI, which will take over the job of creating the container instance. This confirms that the pod is created on the node aci-connector. Make note of the IP address. Let’s go ahead and access the application in the browser. You can easily extend this deployment through the creation of a replication controller and a load balancer. Try removing the NodeName taint from the replication controller definition and watch how Kubernetes spreads the pods across all the nodes including ACI. Feature image by Steve Johnson, licensed under CC BY 2.0.